Tiffany Lee has learned a lot over the past year. She’s learned what to ask farmers about her food, how to handle a kitchen knife safely and skillfully, and that her favorite breakfast is 4505 Meats’ Bacon Maple Sausage Sandwich. As a CUESA volunteer, she’s a regular face at the Ferry Plaza Farmers Market information booth, in the market’s demonstration kitchen, and at special market events. Behind the Ferry Plaza Farmers Market, there is a dedicated group of supporters who help run the show. In the past year, CUESA volunteers have donated more than 3,500 hours of their time. 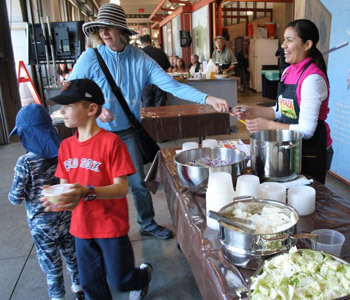 Volunteers assist during cooking demonstrations, answer shoppers’ questions, contribute to educational outreach, and help the market’s many events and festivals run smoothly. Each volunteer has his or her own motivations for participating. Some enjoy sharing information about our local foodshed, while others appreciate the professional development opportunities. Volunteers consistently express that their time at CUESA has helped them deepen their knowledge of cooking and seasonal foods, grow their skill set, and meet new people. 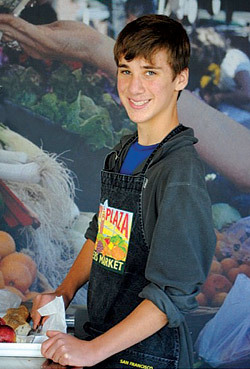 For CUESA, the work of volunteers is not only helpful—it’s indispensable. Volunteers can be found assisting with fundraising campaigns, taking photos of market festivals, and writing educational content for the CUESA website. 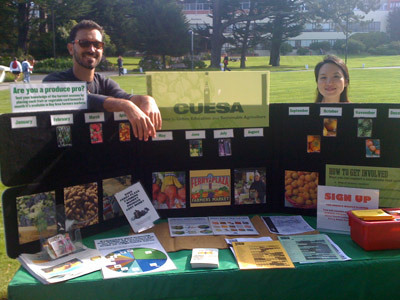 Next year, a newly formed outreach volunteer group will help extend CUESA’s presence in San Francisco at fairs and events, giving volunteers a chance to work on their tabling skills and network with local organizations. In appreciation, CUESA occasionally organizes events for volunteers. Recently, about 20 volunteers enjoyed a tour of Tcho Chocolate Factory. Volunteers also receive benefits such as access to the CUESA library and discounts on some farm tours and educational programs. Interested in becoming a CUESA volunteer? Learn more. This article was written by Michelle Venetucci Harvey, CUESA’s Volunteer Coordinator.